Opanda IExif is a plugin that allows you to right click on a picture and get a popup which shows you the embedded exif information in the photograph. Opanda makes a number of commercial products for managing images but this one is free and useful. I use it when I see an interesting picture on the web and wonder what f-stop, speed, modes, etc. that were used by the photographer. 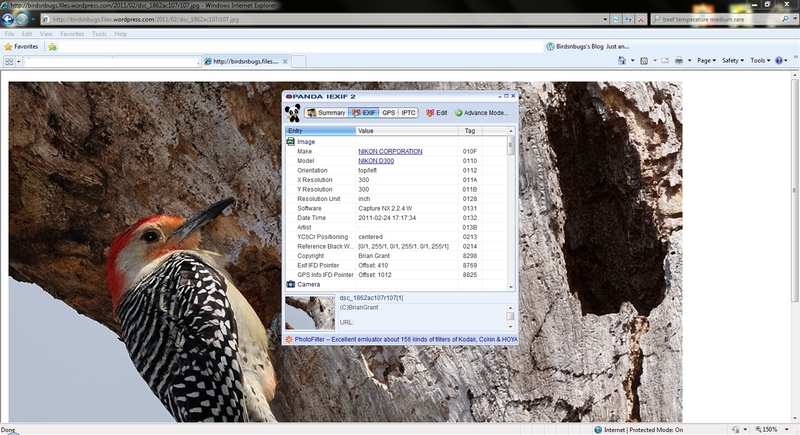 Here is an example of a right click on an image from this page about the Better Beamer. You can scroll down on the Opanda pop-up to see all sorts of information from the Exif. In fact, if you scroll to the bottom, one of the things it will tell you is the total number of shutter operations from the camera that took the picture.